I never realized that breaking up could be fun until I played Heartbreak High. Heartbreak High is a PC game due out May 21st in which you play as the most popular kid in school. You’re so popular, in fact, that you’re dating everyone in school at once. During last period the day before vacation, you decide you need to break up with everyone. You get 40 minutes, in real time, to accomplish this task. You break up with different characters by doing different things. It’s trickier than it seems. You break up with some characters through dialogue prompts, some of which were surprisingly moving. 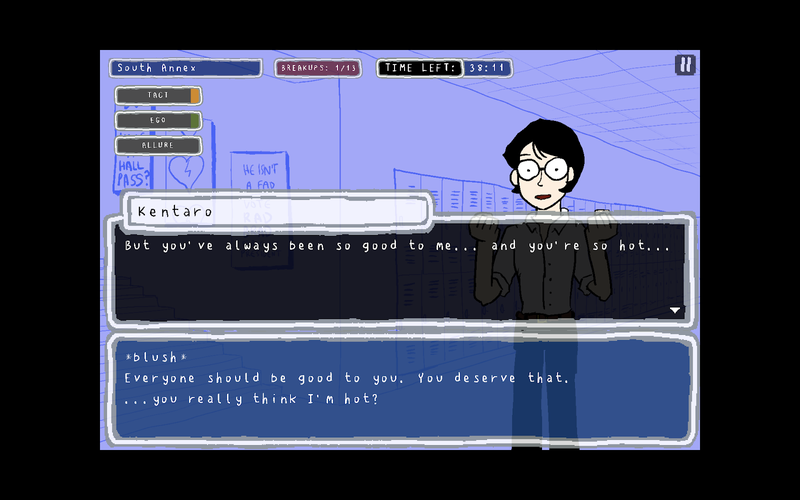 I had to reassure the very anxious Kentaro that he’d find love after me. Akane needed some convincing that this wasn’t a joke. Characters have realistically tender reactions to you wanting to end your relationship so suddenly. Trying to reassure Kentaro that he deserved to be treated well by everyone he dated in the future was a real bittersweet moment, one I recognized from real life. Then the game got weird. Eleanor didn’t want to break up with me at all—and she challenged me to a fight over it. I was then thrust into an RPG style battle where I could use magic against her. I lost, meaning we stayed together. These minigames are varied and fun. My favorite one was when I tried to break up with the track star and had to select dialogue choices while playing a hurdle-jumping minigame. Heartbreak High is a delight. Its minigames are tricky, the writing is funny, and the art is polished and charming. Some of the characters, like Leigh and Morgan, were almost too cute to break up with. I haven’t yet achieved my goal of breaking up with everyone in school, but I’m sure I’ll get there soon, one heartbreak at a time.